Hey everybody, sorry about the delay – I had a minor issue with uploading some of the photographs onto the website. Anyway, I’m here with an update for you with one of our visits to a tent-school inside one of the tent cities. During our visit to all of the places we went, not only schools, the local people spent a fair amount of time simply staring at us. This was not a sign of rudeness or intimidation, but rather curiosity. My braces for example were a big wonder. Kids constantly stared at my mouth, sometimes pointing and asking, at other times smiling shyly. Many Haitians, before the earthquake, rarely encountered white people – and if they did see them, they had minimal to no interaction with that person. So whenever we walked around, we became a common attraction to observe. This was even more evident during our working trips to schools in tent cities, during which we had direct interaction with the students. On one of our visits to a school, after we talked with the kids (11 year olds) for several minutes and became comfortable with them, they began to get a feel for us – literally. My Dad has long, blonde, and fairly straight hair – something that is virtually nonexistent in their culture. 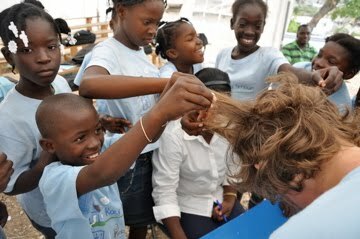 The kids, especially one girl by the name of Shidna, were fascinated with this trait of his, and began stroking his hair. More and more kids joined in, and eventually, something like ten kids were all playing with my Dad’s hair. At the same time, the other kids who couldn’t reach, such as Solomon, Wishiski, Christina, and more (more to come on those kids in the next few days), began feeling either my arms or my Dad’s arms in order to feel our differently-colored skin. Although a bit weird at first, it was fun to allow the kids to quench their curiosity by simply being there. Considering how rare it is for the Haitian people, let alone the children, to see people different than themselves, it is only expected for them to be so eager to experience the differences for themselves. This trait, although it may seem trivial in this situation, is a tremendously important trait to have, as curiosity is the fuel of education. Without a passion and a want to learn more, it will be impossible for Haiti to slowly dig itself out of its current situation and into a brighter future. It is my hope that this aspect of the Haitian people will successfully utilize their curiosity in their education. More to come (new videos!) in the next post!